Chloe Miller is back from the dead and she’s discovering her powers as a free, modern woman. She works together with Alex, his brother and father, and the powerful connection she shares with Alex grows stronger. 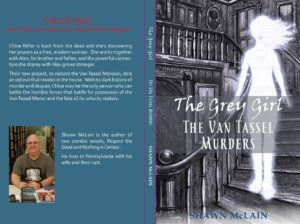 Their new project, to restore the Van Tassel Mansion, stirs an old evil that resides in the house. With its dark history of murder and despair, Chloe may be the only person who can battle the horrible forces that battle for possession of the Van Tassel Manor and the fate of its unlucky visitors.